I recently paid a visit to this vegetarian tacqueria in Fitzroy, another old favourite of mine. This was the first time I’d been since its relocation from its tiny dark spot around the corner on Smith st. The new setup is much larger and brighter, definitely an improvement! The menu hasn’t changed much, with the same small but tasty selection of tacos, burritos and quesadillas filled with beans or tofu. Vegan options featuring soy cheese are available. 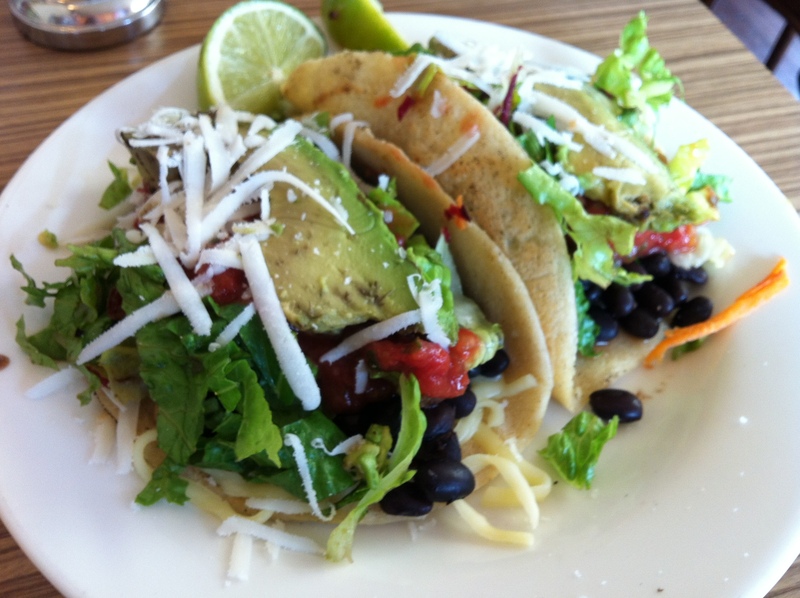 Despite the Tex-Mex appearance, the food here seams to lean more towards authentic Mexican. (I have to tell this to people who ‘don’t like Mexican food’, when they really mean they are averse to copious amounts of cumin and/or sour cream). I had the ‘taco meal’, which consisted of two house-made soft tortillas filled with a delicately spiced black bean mixture, fresh salad, goat’s cheese and lime. I’ll spare you the spiel about how much I love goat’s cheese, but it really did make the meal. It just had a great ‘freshness’ and mix of flavours, so much more than your homemade Old El Paso mix. (Not that I ever use packet spice mixes, being the food snob that I am). To those who dismiss vegetarian food, please come here with an open mind: I promise you won’t miss the meat!